Overview - The motion picture sensation that wowed critics and audiences nationwide, "Trainspotting" delivers a wild mix of rebellious action and wicked humor! It's the story of four friends as they try to make it in the world on their own terms ... and who end up planning the ultimate scam! Powered by an outstanding cast of stars including Ewan McGregor ("Big Fish", "Star Wars Episodes I", "II" & "III") Robert Carlyle ("The World Is Not Enough", "The Full Monty") and Jonny Lee Miller ("Dracula 2000", "Mansfield Park"), and a high-energy soundtrack, "Trainspotting" is spectacular, groundbreaking entertainment. Pain and pleasure are among the two most basic sensations of the human experience, forging a diametric seesaw of highs and lows, each one defining the other, making the wonderful that much sweeter, and the horrible that much bitter. In one way or another, almost everything we do is carried out either in the pursuit of enjoyment or in the avoidance of gloom, and there is perhaps no better literal or figurative embodiment of this constant struggle, than the lofty ecstasy and devastating tragedy of drug addiction. Caught in a perpetual pendulum of contradictory desires, many addicts surrender to the thrilling rush of surging chemicals as a means to numb the harsh realities of everyday existence. Marked by oscillating fits of carefree excitement and aching devastation, it is within this world of junkie purgatory that director Danny Boyle chooses to set his acclaimed film 'Trainspotting.' Through a darkly comedic yet realistic portrayal of heroin addiction, Boyle and his talented cast create an impactful and entertaining journey through the heightened pains and pleasures of drug addled life. 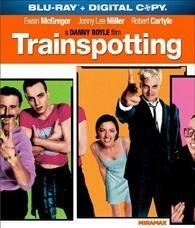 Based on the novel of the same name by author Irvine Welsh, the film follows the lives of five close friends, Renton (Ewan McGregor), Sick Boy (Johnny Lee Miller), Spud (Ewen Bremner), Tommy (Kevin McKidd), and Begbie (Robert Carlyle), as they try to avoid the general responsibilities of life while engaging in heroin fueled mischief. As the story progresses, the focus shifts more clearly onto Renton and we soon follow the character as he repeatedly tries to kick his drug habit for good. Unfortunately, his efforts are continually dashed and conflict arises when he is repeatedly dragged down by his miscreant friends. Loosely plotted and mostly lacking traditional dramatic beats, the film's more visceral approach to storytelling works well with the striking subject matter, blending comedy and drama in an effortless carousel of exciting and disturbing scenarios. In an attempt to assemble an overarching narrative out of the novel's more sprawling, ensemble structure, the filmmakers have placed Renton in the forefront, cementing him as the main protagonist. Voice over from McGregor is heard throughout and thankfully serves to do much more than just comment on the events on screen. Renton's narration actually adds a level of intimacy to the proceedings while filtering the actions of the story through the character's unique and entertaining perspective, revealing bits of his personality to the audience. His opening lines, as married to Boyle's kinetic visuals, perfectly set the stage for the film and serve to thrust the audience headfirst into the adrenaline pumping world of the picture. The character's overall arc is handled well, and as the only member of the group (outside of Tommy) that shows any real sign of potential, he makes for a solid emotional core that helps to stabilize the viewer through the rest of the movie's chaos. From a purely performance perspective, McGregor does a fantastic job and brings just the right amount of charisma and compassion to the role that balances out the other potentially unlikeable aspects of his character. The rest of the cast all do a phenomenal job as well (including the lovely Kelly Macdonald in her big-screen debut), and each member of the gang creates a distinct, interesting, multifaceted individual. The deep bond between the group and their evolving relationships with one another are an essential aspect of the story, and the film deals heavily with the theme of friendship. Throughout the proceedings it becomes clear that Renton has outgrown his troublesome companions and his inability to separate himself from them forms the movie's main external conflict. The film's other central source of drama comes in the form of the characters' internal and physical struggles with addiction. The movie never shies away from the often disturbing realities of drug use and features many horrifying scenes that will linger with you long after the screen goes black. At their core, these characters are all broken people looking for an easy fix. They don't want to hurt, ache, or struggle. They don't want to deal, cope, or feel. All they desire is a singular path through life, free of complications and responsibilities, trapped in a daze of heavenly delight, and heroin has become that means to escape reality and live on worry free. Of course this one time solution to their problems also becomes a perpetual source of new ones, and as tragedy strikes in between hits or during intermittent stretches of sobriety, pangs of painful humanity bleed through. One character's gradual decline is particularly hard to watch and another scene featuring a baby might contain one of the most disturbing images ever captured in a mainstream film. On that same note, however, as much as the drug use is often painted in a negative light, Boyle doesn't hide from the more pleasurable aspects that also come from the habit, and he isn't afraid to show the characters having fun with and enjoying the illicit chemicals that they pump into their bodies. It's a complicated subject that is far from black and white and by presenting a well rounded view of the matter, the film retains a rare level of authenticity and integrity. Not merely content to let the characters have all of the fun, the camera itself joins the gang on their various trips into medicated bliss and torment. The movie is a veritable stylistic bullet train, blazing through its hour and a half running time with all sorts of visual treats and kinetic cinematic touches. Boyle creates a kind of hyper-real atmosphere and even delves into occasional surreal imagery to help bolster the drug induced and withdrawal fueled hallucinations of his characters. Various lenses and angles distort the frame into off-putting compositions, and fast cuts, sped up frame rates, and shifting camera movements create a dynamic and unpredictable feel. A few gross-out setpieces (the infamous toilet scene among them) are joined by an overall sickly color palette, and the dirty, grimy production design oozes with filth. In fact, I sort of wanted to take a shower after the movie was over. Music is also used brilliantly, with a strong collection of 80s and 90s electronica and rock tracks that become perfectly fused with the images they complement. 'Trainspotting' is an entertaining and thought provoking examination of junkie culture, addiction, and friendship. With its loose plotting and complex characters, the filmmakers resist the urge to further any kind of take home message, ultimate moral or clarifying solution. In the end, we are left to draw our own conclusions negating usual Hollywood conventions. This is a truly visceral experience that somehow manages to balance a strong sense of humor with pulse-pounding excitement and disturbing tragedy. With a relentless pace, impressive performances, and strong artistic direction, Danny Boyle comes away with a modern classic. Previously released on Blu-ray in various foreign markets (including a Japanese import) Lionsgate presents this domestic release of 'Trainspotting' in a Blu-ray/Digital Copy combo pack. The release includes one BD-50 Blu-ray and a separate disc for the digital copy all housed in a standard case. After some skippable trailers, the disc transitions to a standard menu. The package indicates that the release is Region A compatible. The movie is presented in a 1080p AVC/MPEG-4 transfer in the 1.85:1 aspect ratio. With its rough and somewhat harsh look, the film has a fairly underwhelming but still seemingly authentic appearance. The print is in good shape with only some minor specks here and there and a thin layer of natural grain. Some edge enhancement is visible but it doesn't detract much from the presentation. Detail can be good but the movie has a predominantly soft look that lacks impressive levels of clarity and depth. Colors tend to favor a sickly palette of muted hues that fit well with the content but don't offer much pop. With that said, there are indeed splashes of vibrancy sprinkled throughout the production design, including some bold reds. Black levels are solid and contrast is strong without being unnatural. While fairly rough, flat, and never very impressive, the transfer seems to represent the material accurately with no major signs of unnecessary manipulation. Though decidedly average and at times a bit ugly, this is probably about as good as the movie can look. The film is provided with an English DTS-HD Master Audio 5.1 track along with optional English, English SDH, and Spanish subtitles. Fueled by a memorable soundtrack of house, rock, and electronica tracks, the mix brings some welcomed energy and kick, bolstering the visuals nicely. Dialogue is clean and full (though the cast's Scottish accents can still be difficult to make out). Directionality and surround use are a little sparse at times but do offer some appropriate instances of ambiance and immersion. The track tends to be the liveliest during sequences that take place in noisy clubs or during the movie's more kinetic, hallucinatory and surreal scenes. The song selection fits nicely with the images on screen, and the music often comes through with some strong fidelity, range, and bass activity. With this mix, the film's famous and very popular soundtrack comes through strongly, offering some pleasing punch and sporadic immersion that enhances the energetic quality of the visuals. Lionsgate has put together a nice collection of supplements, including a commentary, deleted scenes, and several featurettes. All of the extras are presented in standard definition with Dolby Digital 2.0 sound and no subtitle options. Audio Commentary by Danny Boyle, Andrew Macdonald, John Hodge, and Ewan McGregor - Compiled from interviews recorded with the participants in 1996, this commentary is very informative but slightly subdued. The filmmakers provide lots of details on various aspects of the movie's production, including locations, casting, changes from the book, the look of the film, getting someone to actually let them use their baby in the movie, and information on deleted material. Though some of the insights and stories offered here do get repeated in other supplements, fans should definitely take a listen. Deleted Scenes (SD, 11 min) - Nine deleted scenes are available to watch separately or together, with or without commentary by the filmmakers. The scenes offer a bit more backstory and flesh out some of the secondary characters and were all cut either for time or to help shift the focus more clearly toward Renton. Look of the Film (SD) - Two featurettes are included here. "Then" (4 min) features a vintage interview with the production designer showing off various visual references and inspirations for the movie. "Now" (3 min) includes interviews with the filmmakers conducted in 2003 further discussing the heightened visuals of the picture. Sound of the Film (SD) - The sound of the movie is the focus here with two more featurettes once again separated into "Then" (8 min) and "Now" (5 min) sections. "Then" features an interview with Danny Boyle and Andrew Macdonald conducted during the movie's original sound mixing and "Now" includes 2003 interviews with the filmmakers all discussing the sound design process and the importance of the music tracks used. Interviews (SD) - Interviews with Irvine Welsh (5 min), John Hodge (8 min), Danny Boyle (15 min), and Andrew Macdonald (11 min) are all viewable separately. The participants discuss various aspects of the movie's production including adapting the book, casting, financing, and audience reaction to the finished product. Behind the Needle (SD) - This is an in depth look at creating one of the shots where Renton injects himself with heroin. Three different angles are available to view that feature either Danny Boyle watching and commenting on behind-the-scenes footage, the raw footage itself, or a split screen view of both (6 min). Also included is a brief interview with Ewan McGregor labeled "Calton Athletic Boys" (30 sec) that features the actor discussing his experiences with real drug addicts. The Making of Trainspotting (SD, 10 min) - This is a basic making of featurette that includes on-set interviews with the cast and crew and some behind-the-scenes footage. Though some information is repeated from the previous featurettes and commentary, this is still a decent but very brief look at the production. Cannes (SD) - Interviews with Martin Landau (1 min), Noel Gallagher (2 min), Damon Albarn (1 min), and Ewan McGregor (1 min) are included from the Cannes Film Festival where the movie screened out of competition. A brief Cannes Snapshot (2 min) is also presented that offers a quick look at the film's screening party and includes more brief interviews with various stars. Unfortunately, there really isn't much to get out of any of these. Gallery (SD, 5 min) - This is a slideshow of production stills and on-set photos. Theatrical Teaser (SD, 1 min) - The movie's teaser is included in standard definition. Theatrical Trailer (SD, 2 min) - The movie's trailer is included in standard definition. 'Trainspotting' presents an entertaining and visceral journey into drug infused mischief, humor, violence, and tragedy. With strong performances and exciting visual direction, the film features many powerful and memorable images and scenes. The video transfer is a bit underwhelming but seemingly authentic, and the audio mix features some solid effects and great music. Supplements are plentiful and informative, rounding out a nice disc for a very good film. This is an easy recommendation.